Fleetwood Town's reward for winning their FA Cup replay at Hereford FC next week will be a thrilling home tie against Jamie Vardy's Leicester City in the third round. Striker Vardy left Town for the Foxes in 2012 and has gone on to win the Premier League title and 19 England caps. 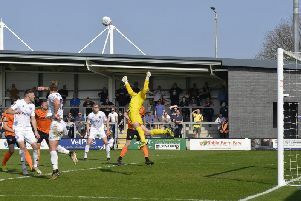 Also facing a possible first-ever competitive clash with Premier League opposition are AFC Fylde, who will visit Bournemouth if they can overcome the odds and win their replay at Wigan Athletic. The stand-out tie of the draw made at Slough Town is Liverpool v Everton and all the ties will be played over the weekend of January 5-7. FULL DRAW: Ipswich v Sheffield United, Watford v Bristol City, Birmingham City v Burton Albion, Liverpool v Everton, Brighton v Crystal Palace, Aston Villa v Woking or Peterborough United, Bournemouth v AFC Fylde v Wigan Athletic, Coventry v Stoke City, Newport County v Leeds United, Bolton Wanderers v Huddersfield Town, Port Vale or Yeovil Town v Bradford City, Nottingham Forest v Arsenal, Brentford v Notts County, QPR v MK Dons, Manchester United v Derby County, Forest Green Rovers or Exeter City v West Bromwich Albion, Doncaster Rovers v Slough Town or Rochdale, Tottenham Hostspur v AFC Wimbledon, Middlesbrough v Sunderland, Fleetwood Town or Hereford v Leicester City, Blackburn Rovers or Crewe Alexandra v Hull City, Cardiff City v Mansfield Town, Manchester City v Burnley, Shrewsbury Town v West Ham United, Wolverhampton Wanderers v Swansea City, Stevenage v Reading, Newcastle United v Luton Town, Millwall v Barnsley, Fulham v Southampton, Wycombe Wanderers v Preston North End, Norwich City v Chelsea, Gillingham or Carlisle United v Sheffield Wednesday.